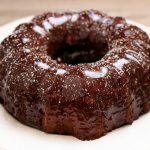 The most moist chocolate bundt cake ever! This cake is cooked using steam in your Instant Pot and then covered in a rich chocolate glaze. Just try to eat one piece! Bring 3/4 cup water to a boil (I used my microwave) and then stir in the cocoa powder until smooth. Set aside. In a large bowl use a whisk to stir together the sugar, salt, baking soda and eggs. Add in the yogurt, oil and vanilla. Whisk until smooth. Stir in the flour and mix for 2 minutes. Add in the cocoa mixture and mix for 3 minutes. Fold in the semi sweet chocolate chips, if desired. Spray a half size bundt cake pan* with non-stick cooking spray. Pour the cake batter into the pan. Pour 1 1/2 cups water into the bottom of your Instant Pot insert. Place the bundt cake pan on a trivet with handles* and lower the cake into the bottom of the Instant Pot. You can also use a sling if you don’t have a trivet with handles. Cover the pot and secure the lid. Make sure valve is set to sealing. Set the manual/pressure cook button to 27 minutes. When the time is up let the pot sit for 10 minutes (display will say L0:10) and then move the valve to venting. Note: Several people who have made this cake have mentioned that 27 minutes was not enough time. The times that I’ve made the cake 27 minutes has been perfect. You may want to increase the time to 32 minutes. Remove the lid and use hot pads to carefully remove the trivet and cake. Let it sit on the counter for 10 minutes. Loosen the sides of the cake from the pan and gently turn over onto a plate. Make your ganache by heating your heavy cream until almost boiling. I used my microwave on high for 1 minute. Then pour the chocolate chips into the cream. Let it sit for 4-5 minutes and then whisk the chocolate into the cream until smooth. Pour the ganache over the surface of the cake, letting it drip down the sides and middle. Let the ganache set for a few minutes (as long as you can stand) and then slice and serve. The original recipe had a different glaze. I changed it to a simple ganache because it’s easier and I think it actually tastes better. If you’re interested in the original glaze here are the instructions: 1/2 cup semi sweet chocolate chips or dark chocolate chips, 6 Tbsp unsalted butter, 1 1/2 cups powdered sugar and 1/4 cup sour cream. Make your glaze by melting the chocolate chips and butter together. You can do this in 20 second increments in the microwave or on the stove top in a saucepan over low heat. Whisk in the powdered sugar and sour cream until the glaze is smooth and shiny. Pour the glaze over the surface of the cake, letting it drip down the sides and middle.